It took me a while to finally head into this one. Despite the fact that upon it's Netflix premiere becoming the most watched and most popular Netflix release ever, it was received with very mixed reviews, with most of the word-of-mouth being that it was just "alright", or "not as good as it could have been". And it seemed like every day for weeks someone was posting about it. So I waited for the dust to settle before finally digging in. This past Saturday night I finally decided to give it a shot, and while I wouldn't exactly call it great, I did enjoy it very much and it marks a strong comeback for director David Ayer, who sort of fumbled a bit with his previous effort The Suicide Squad. While this wouldn't be considered one of his best films, it's a fun way to spend 2 hours of your time if you enjoy action/sci-fi/fantasy hybrids. And really, who doesn't? 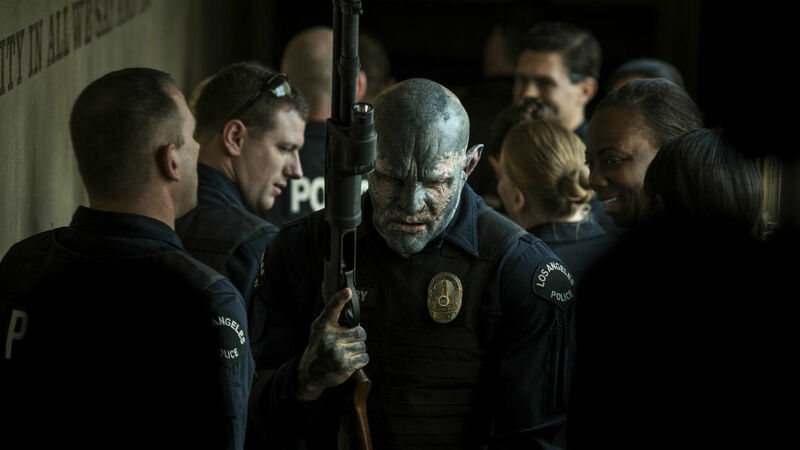 If I were to pinpoint what kind of film this is, it's like a cross between the excellent Alien Nation and Colors, two films that were both released in 1988, only with orcs and fairy's instead of aliens and gang members. Writer Max Landis (son of John Landis), who exploded on the scene with his screenplay for Chronicle back in 2012 and has continued to deliver a steady stream of content in both film and television (rumored to be writing and directing a remake of is father's classic An American Werewolf in London) incorporates enough new fantasy and mythology into the material that wholey makes this it's own beast in a clever way that I hadn't expected, with David Ayer delivering some solid camerawork. He doesn't quite reach the level of awesome he did in Fury, instead choosing to fall back on what he did in Suicide Squad with a good portion of it sticking to his fast, loose and freestyle approach. That's not to say there isn't some impressive camerawork in here, because there is. Some shots mightily impressed the hell out of me a number of times, and I wish he had stuck to a more structured approach like those more often because some of those visuals were fantastic. Yet, it also feels like a made-for-tv movie at times, which it technically is. On a visual level, it's sort of a mixed bag. I wouldn't consider myself a Will Smith fan per say, but I do respect that guy as an actor and I admire the fact that he's a very hard worker, and a damn good actor. I've never seen a film where I felt like he was miscast or phoned it in. For all intents and purposes, Smith has never let me down or failed to deliver the goods. He's a much better actor than most people give him credit for. And that really could just be the roles he chooses, where maybe some really don't allow him to stretch his acting muscles. But here he turns in another great performance and he may not be the #1 blockbuster star anymore (there was a time when every one of his films debuted at #1, making him one of the most successful stars on the planet), but he never fails to deliver the goods. The real standout here for me was Joel Edgerton. Even under a pile of makeup and prosthetics, the guy delivers his lines, body language and emotions so thoroughly and convincing that he easily walks away the most impressive and the endearing in the entire film. I'm not saying that this was incredible, but definitely a fun way to spend your time. It's a cop/buddy movie with sci-fi/fantasy overtones that mixes all of these elements together in a way that hadn't yet been done before.....surprisingly. Max Landis' script is fresh when it needs to be, yet familiar at the same time. David Ayer's direction is pretty solid overall. I would have preferred him to take more time setting up some killer shots, but in the end, he thankfully doesn't revert back to his Sabotage or End of Watch handheld aesthetic. The performances ares strong across the board and the effects work, violence and action are handled exceptionally well. Yet, with all these strong points, it always feels like something is missing, or the beat is off somehow. I can't really put my finger on it. 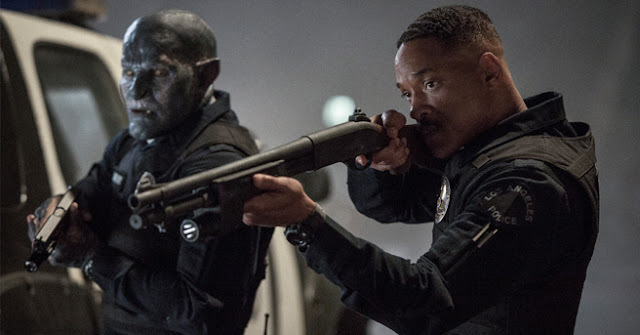 On the plus side, Bright was so successful that Netflix has already ordered a sequel, which David Ayer is reportedly going to both write and direct himself this time around. Who knows? Maybe this is the beginning of a really solid franchise? Only time will tell.